The eye cannot comprehend. The retina and pupil bounce skittishly, dividing the line between shock and horror. It’s the shot of the movie, that full screen close-up of Sally Hardesty’s eye that is a portal into unbelievable macabre and incomprehensible mayhem. In just one shot, schizophrenia is captured. It is a visual that demonstrates that some things are beyond the limits of what the mind can process. And Tobe Hooper has plenty more where that came from. There is a satanic hitchhiker whose hair looks like it is caked with a mix of sweat, spit, and dried-up blood. A graphic discussion of a local slaughterhouse makes you believe you are peeking through a window and witnessing the kills, even smelling the rotting stench of death. There is an ominous gas station in the middle of nowhere with an attendant and his deformed sidekick, both eyeing a van full of ripe teenagers with more than just a casual interest. Before long, we arrive at an abandoned farmhouse that is conveniently located a short distance away from what we will soon discover to be ground zero of terror. And has there ever been a more excruciating, gut-wrenching chase scene in any movie than the one where poor Sally can’t seem to distance herself more than a few feet from that relentless chainsaw-wielding maniac? Leatherface doesn’t possess the slow gait of Michael Meyers. He’s sprinting full bore, chainsaw revving. The craftsmanship that Hooper and company put into the original is sometimes forgotten due the movie’s sequels, prequels, and remake. Perhaps even the movie’s title does it a bit of a disservice, suggesting something along the lines of mindless exercise in blood and gore. But, really, as far as horror movies go, there isn’t nearly as much of these obligatory crutches as one might expect. This is a film that rises above a genre it helped define. The scariest moments are locked in what you don’t see rather than what you do. Who or what is going to come out of that creepy red door? What’s with the gas station attendant anyway? And the hitchhiker? Who is responsible for the ghoulish graveyard vandalism? The brutal anticipation laced with overwhelming dread is relentless. Raising the stakes and making it all the more shocking and frightening is the raw, gritty style of the film. It feels like a documentary or, to some extent, even some sort of snuff film. There will never be another quite like it. Sure, there have been other great horror movies before and since. And there will continue to be an endless regurgitation of cookie cutter rip-offs. 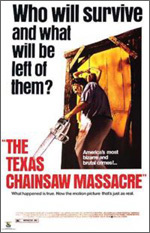 But to this day, for my money, The Texas Chain Saw Massacre remains the scariest movie ever made, bar none. And that means something.